And my response to that is always, “Why?” The truth is that potatoes are actually very healthy for you when eaten the right way. 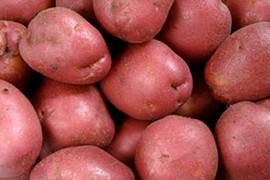 Potatoes have a bad reputation for being fattening, but that is really not the case. A medium size baked potato with the skin has only 160 calories, is low in sodium and is virtually fat free. Not only that, potatoes are loaded with vitamins and minerals. They are a good source of potassium, fiber, iron, phosphorous, vitamin B6, vitamin C and niacin. Now to get all those nutrients, make sure to eat the skin, since many of the nutrients are concentrated there or directly below it. How should I eat my potatoes? Stay away from fatty toppings: For a healthier alternative to fatty toppings, try salsa or herbs, such as garlic, oregano, basil or pepper to spice up the taste of your potato. As for potato salads, there are some wonderful recipes out there that don’t use mayonnaise and are not only healthier, but tasty too! Don’t fry your potatoes: Fried potatoes have up to three times more more calories and up to twelve times more fat then a baked potato. Eat the skin: The skin is actually tasty and is filled with wonderful vitamins and minerals. The only reason to not eat the skin, is if you notice it has a greenish tinge. That means that it has been exposed to too much light after harvest and is damaged. Eating that area could cause cramps, diarrhea and fatigue. So, cut that portion out. So, if you are watching your weight, don’t cut out the potatoes. Cut out the high-fat toppings, fried foods and high-calorie sweets, instead. After all, potatoes are not only almost fat free, they are also packed with vitamins and minerals! Thanks for setting the record straight on a very mis-understood veggie. French fries=bad, but baked potatoes especially w. the skin=filling and nutritious. Small world, saw some dude twittering you with Monterey I use to go there in the early seventies. Some crazy dude pulled my hair out by the roots on the beach. And I saw Paper Moon at the local theater there.